Kaique Pacheco was 88 points on this bull just last week in Springfield. This is a great opportunity for Marcilio on one of the better bulls in the round, but Pennywise isn’t a day off. Statistically this bull has no chance of throwing Vieira off, but he does have a decent chance of winning this match by exploiting Vieira’s only real weakness. Red Rocket has some history of being bad in the chute, and despite the fact that Vieira is one of the best riders in PBR history, he is just terrible in the chute. There are high school bull riders better at chute procedure than him. He’s missed a number of great opportunities because he was unable to make it from the chute to the arena. Eldred has been struggling lately, but it seems like he’s also drawn a lot of bulls all season that he shouldn’t struggle with. This may be the best possible bull in the round for him to face, and if it weren’t for the slump it would be easy to say this bull has zero chance of bucking him off. However, it’s easy to fall off any bull any time – even bulls that aren’t close to being good enough to be here. Eldred should be huge favorite here if he can return to his normal form. Red Bandana is such an all-around good draw for anyone that he often ends up in the reride pen. Lima has a great opportunity here. This may not be the easiest bull in the round, and he’s big and heavy, but he has great timing and gives up scores on a regular basis. This may be the best matchup in the round. Pacheco won’t get an easy score here, but he may get a big one. Acting Crazy has huge score potential, but his difficulty level is up there too. Pacheco is on top of the bull riding world right now, and he’s riding well, but we saw a bull work him loose with continual effort last week in the short go, and that’s the approach this bull takes every time. He’s good at keeping the pressure on riders and forcing them to be perfect. Lab Rat is one of the more difficult bulls here, but he’s been pretty good to right handed riders. He can have some forward movement, and that plays into Willingham’s biggest weakness, but he also spends a lot of time in the air which may negate that advantage. Overall, he isn’t a bad fit for Willingham, and the veteran rider could come away with a good score here. Alves has been riding reasonably well, and this bull is a pretty good draw for any rider. Levi has great timing and doesn’t usually pull any dirty tricks. Alves should have a slight advantage in this matchup. This bull can have some hesitation and lazy, delayed jumps that give him some difficulty, but he’s given up four rides in his last seven outs. No matter what he does here he’s going to have to work hard to get Nance on the ground. There have been plenty of riders in the PBR with more talent than Nance, but very few ever make the most of their talent to the extent that Nance does. If every rider at this level utilized their ability as much as this guy, Cody Lambert might have to search harder to find bulls who could keep up. Barbosa took this bull 7.79 seconds in Springfield last week, and he’s likely to get the job done here. 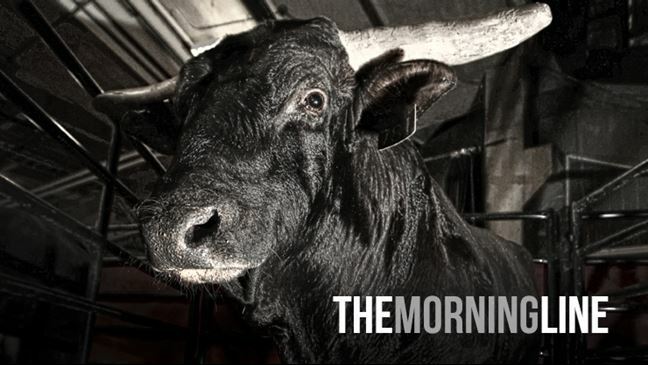 This bull isn’t easy, but riders at this level aren’t supposed to let one slip twice in a row. © 2018 PBR Inc. All rights reserved.